Graham must like rocks as much as I do. He has them all around his house. The gardens and lawn are huge there but around the house itself are just rocks and a very few cacti. (Yes, cactus in Canada, growing wild and outdoors all year long). 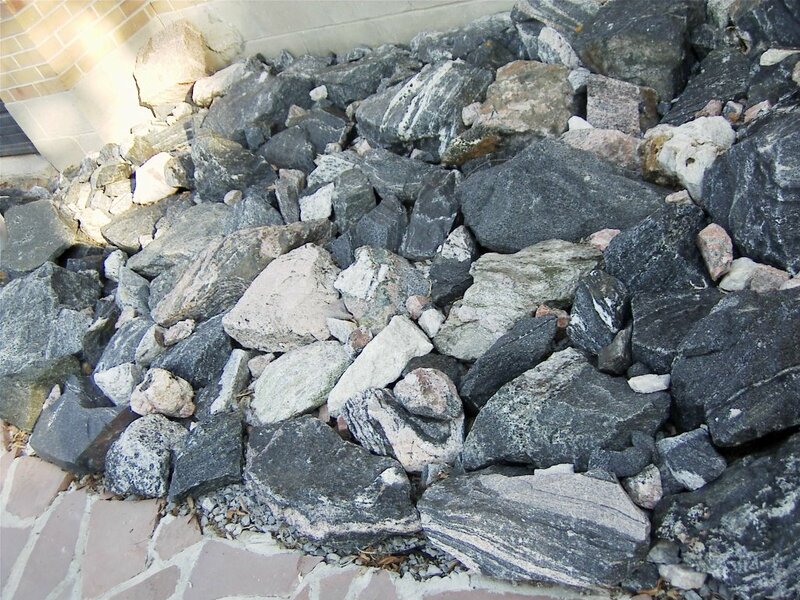 This is a rock picture from his house. I was looking forward to the rock pictures at least as much (maybe more) than the rose pictures. But they were the ones I took and goofed up. I did this one yesterday just before the camera decided it was full, 36 pictures were stored on it so that is better than a roll of film which gets 26 if you push it. Anyway, I will take more rock pictures next time I drive down there. This one I will keep but I will crop it before using it as desktop background. Those are the rocks in the front yard which came from farther north, Canadian Shield Rocks. The ones in the back were from beaches and foresty areas closer to our area. The backyard rocks are all round and smooth edged. I think they will turn out really well. The bigger, rougher rocks look a lot better in person than in pictures.